It is official. November 1 means the beginning of shopping for presents. So I decided to scout around for Almost Free Gifts for the Kiddos. As the magazines start rolling in, hopefully, so will the creative ideas for bottom-of-the-budget-bucket gifts. First off, we aren’t going to find anything in the Toy Aisle that meets this criteria, but perhaps we can shop down some of the other aisles. How many times have you heard the kiddos ask, “Can I help you cook?” They love “helping”, it just takes some patience and time on our part. Here is a gift that will create a memory. Buy a Cake Mix, and some Baking Supplies for your Sous Chef, and wrap them up with a large Coupon For Cooking This Friday At 2:00. A specific time and date helps as the mini chef won’t spring the coupon on you the same day you are having 20 guests over for Christmas Caroling. 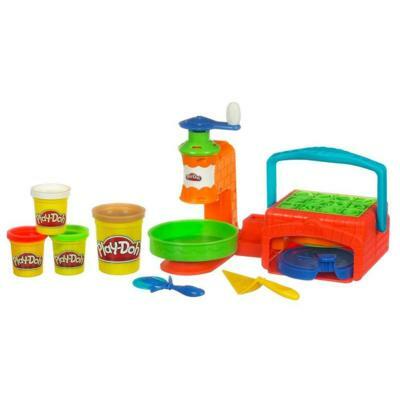 It also gives the mini chef some time to anticipate and discuss with you the upcoming cooking date. Here are some ideas from Dollar Tree (where everything is a dollar)–plastic cake saver, measuring cups and spoons, spatula, apron, cake pan, cake decorations, etc. . . The measuring cups I bought my kiddos have ended up in the bathtub toys collection and then moved out to the sandbox where millions of mud pies were made. Fantastic. A gift that keeps the imagination sparking and sparkling. I grew up in South America where they love more than anything to stand in lines for “official stamps” on everything. I remember being mesmerized by the sound of a rubber stamp banging down on an envelope or official document. My father had some rubber stamps at his desk, and we loved to steal them along with some envelopes and writing paper and play Post Office. When I taught kindergarten, one of the favorite play stations was The Post Office. Why not create this same fun for your kiddos. The Mail Box: Grocery stores are happy to part with cardboard boxes. Get a couple of boxes, a box cutter, and some duct tape to make a mailbox. Spray paint the cardboard to make it easy. My local Dollar Store sells vinyl letters that I use for everything. While you are at the Dollar Store, pick up some envelopes, a date stamper, stickers, and some paper. Leave the rest up to their imagination. See these kids in the Pottery Barn catalog having fun? You too can plan a Living Room Sleepover. Make up some hot cocoa, have some good read alouds handy, or just whisper and giggle right along with them under the magic of the Christmas Tree lights. If you feel the need to buy something, perhaps Oriental Trading Company’s Hard Candy Spoons will add to the Living Room Sleep Over. Becky’s Christmas by Tasha Tudor. This is out of print and expensive, but perhaps your library still carries a copy. An old tale that was adapted by Leo Tolstoy (yes The Leo Tolstoy) and retold by Mig Holder. Papa Panov’s Special Day I prefer the edition illustrated by Tony Morris, but couldn’t find it on Amazon. Benny’s Flag This isn’t a Christmas story, but it is about Alaska, an orphan boy, and the Alaskan Flag. It is definitely a “cold” read with a heart-warming real-life story line. You could also bring out the references to stars in Benny’s Flag and the Star that guided the Wise Men to the CHRIST CHILD. I can’t help it, I love this book of woodblock prints. Educational, yes. Beautiful, yes. Suitable for a fireside read, yes. It is just a family being and growing (watch the mommy) together. Simple. A Year of Birds by Ashley Wolff. The Dollar Store is great for some supplies, however, when I buy actual toys for the kiddos, I respect quality. 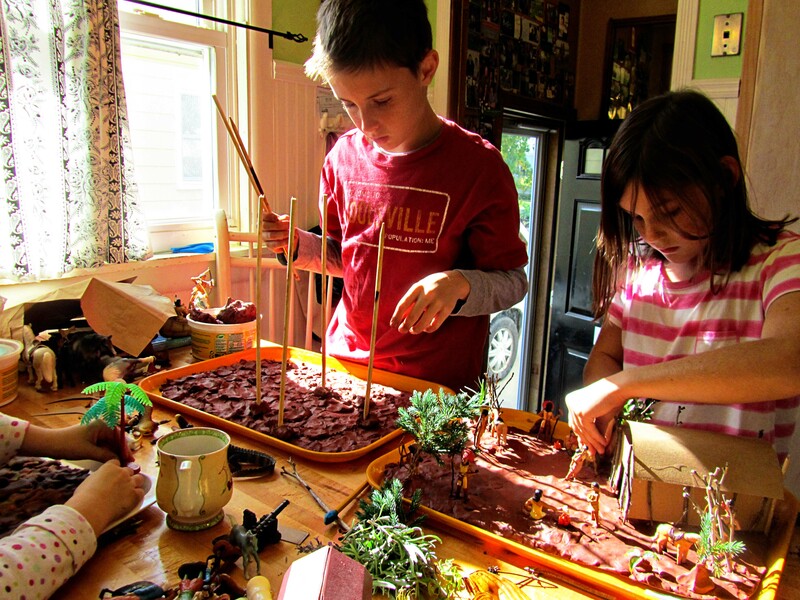 Since we Homeschool, we end up building forts out of Lincoln Logs, constructing the pyramids with blocks, making Indian Dioramas, and so many more projects. Here the kids are making Indian Dioramas of the different dwellings of different Indian groups. Plan an evening of board game fun. Pop up some popcorn. Pour the Apple Cider. Set out the gifts. Gifts? What gifts? Are your board games missing pieces? Ours are. Before the Big Board Game Night, hunt for board games at your thrift store. Take the missing pieces from the recently purchase board game and wrap them up. Give each kiddo a little gift of the missing pieces from their favorite board game–perhaps Daddy too. We live in a generation where youth is idolized. I’m sorry, I will get off my soapbox now before I get started. The older generation has wonderful wisdom and skills to share. Ask around your church/meeting, Senior Center, or among your neighbors if someone would be interested in giving 2 evenings of knitting lessons. Once a date is reached, leave simple cards on the breakfast plates of the kiddos along with two knitting needles and a ball of yarn. Unexpected surprises make days fun. When you drop the kiddo off for a knitting lesson leave a container of homemade soup or loaf of fresh bread on the counter. The neighbor/friend won’t expect it, but will feel appreciated. The Lion Brand Kid Needles are $6.99 at Joanne Fabrics. The Lion Brand Wool-Ease yarn is $2.50. Sign up for a coupon and get them both for about $7.00. Think back to your childhood. Remember three favorite times. Do it. Now are these memories about gifts? or about a time spent with loved ones? As a mom, so often I get stuck in the “things” category, when the kiddos so love activities. Plan a winter hike. Fill the thermos with hot soup and take along a loaf of crusty fresh bread wrapped in some towels and foil. Kids love to carry backpacks, so let them carry their spoon bowl, drink, and napkin. Tuck in some candy when they aren’t looking. Take flashlights if it will get even remotely “darkish”. Kids love flashlights. Pack the car. Hit the road. Bundle up. Hike. Enjoy the soup along the way. Don’t forget to take wet-wipes, kleenex, camera, and a Ziploc bag for bringing home any trash. I hope this triggered some ideas in your home. I’m going to try and post some more gift ideas–say “$20.00 and Under”, and maybe “That Dad You Love So Much, but Don’t Know What to Buy”, and maybe “Quailty Gifts for Kiddos that Last”. Of course, this is all what I’d like to accomplish, not what I will accomplish. This entry was posted in Projects and tagged cheap gift ideas, inexpensive gifts for children. Bookmark the permalink. Almost makes me wish my 7 were small again….. I said almost!! Since I have a “fresh” cold, and housebound, there is time for reminiscing (sp). Sorry to hear about your cold. It is no fun being sick. I hope you feel better soon. Thanks for the ideas! Last year we celebrated the season for the month of December. Each day we did something different, crafts, coloring pages, sing Christmas carols, bought toys for underprivileged kids, read the Christmas story, baking, etc. I am looking forward to doing it again this year.